Believe it or not, not everyone wins money at poker. 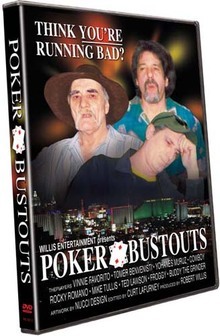 A new documentary–Poker Bustouts—interviews nearly 20 players about the not so glamourous aspect of poker: the losing. Exposing this seedy underbelly include 2003 WSOP ME 5th place finisher Tomer Benvenisti (and what an underbelly it is with him), 2004 WSOP PLO winner Ted Lawson, and seasoned pro Yohanes Muruz. From the Las Vegas Sun’s review of Poker Bustouts, it sounds like this doc might be a totally one-sided affair. And that’s fine. It’s documentary. That’s the dark underbelly of documentaries: they have an agenda. We all know that any form of gambling, even one mostly predicated on skill, will attract some low-lifes. But part of the allure of poker is this darker side, so why not shine a light on it? It is what it is. So Wicked Chops Poker is putting in an order for Poker Bustouts, expecting off the charts unintentional comedy from some of those interviewed. Will it top our best poker movie of the year? Probably not. But we’ll let you know if it’s worth one of your grinded out Andrew Jacksons. Mundiales de Poker. El mundo de los perdedores. I’m not going to go to vegas007.com. Especially b/c these guys keep spamming about it.